Summary: Roof vents and attic vents are important as proper roof ventilation and attic ventilation extend the life span of your roof shingles and roof framing by decreasing moisture year-round and heat buildup in the warmer months. Moisture and heat buildup in your attic increases the cost of heating and air conditioning by rendering attic insulation worthless. Moisture causes wood rot, metal to rust, mold formation, and in colder climates, all the that plus roof ice dams in the winter. In short, attic moisture destroys wood and insulation. There are other problems with inadequate attic ventilation, but these reasons should be enough to make you, as you the General Contractor or home owner, be concerned and make sure your carpenters or roofers provide for adequate attic ventilation. The use of roof ridge vents for exhaust and soffit vents, under eave vents, or vented drip edges for air intake, can provide continuous air flow minimizing the buildup of heat and/or moisture without the use of anything but Mother Nature. Even in the dead of winter warm moist air rises. Here is an illustration of the theory, courtesy of Air Vent, Inc. Here are pictures of those types of vents, 1. Ridge Vent 2. Soffit Vent 3. Vented Drip Edge 4. Under Eave Vents courtesy of Air Vent, Inc. NOTE: I recently received an email from someone who lived in a very dry (desert) climate who wondered how to vent attics that had flat roofs and if it was necessary to do so in a dry climate. I responded by telling him that all roofs should be ventilated no matter where you build. Moisture occurs everywhere, even in the desert. Below is a ventilation system for flat and low pitched roofs. 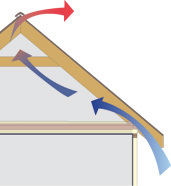 A flat (or low pitched) roof does not have an air inlet. Without proper cross ventilation, heat and moisture are trapped in the attic and roofing system, decaying the structure. Courtesy of roofvents.com. Take heed! I learned things the hard way. With my books and www.byoh.com, you don’t have to.